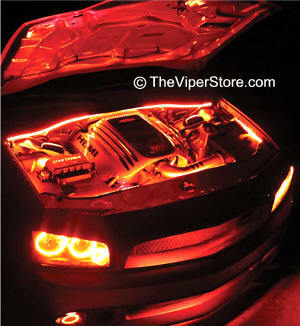 For any of our LED light kits below that do not already come with a remote you would wire it up directly to your cars 12 volt power source. To a existing switch or lights such as the interior door light. You could also insert your own switch if you like. When directly wired either to the battery with a simply switch (not included). If wired to a light socket or interior wiring in the car then the lights would come on when where ever you wired it to is activated. 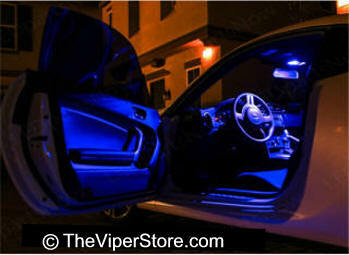 For example; if you wired the interior LED's to the cars dome light, when the door opens the LED's would come on. When the door shuts the LED's would turn off automatically. You get a controller box with the remote. You would run all your led lines directly to the controller. The controller would be wired to your car battery. Your remote control would be wirelessly connected to the controller box. 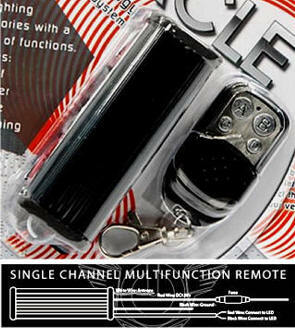 You can control all functions from the remote. You use this multifunction switch instead direct wire or a remote. Accessories with a variety of functions; can also operate with Home-Link Technology. • Mount box in a Cool /Dry Location. • Remove Fuse While Installing. Comes with a controller box that you wire directly to your cars battery. 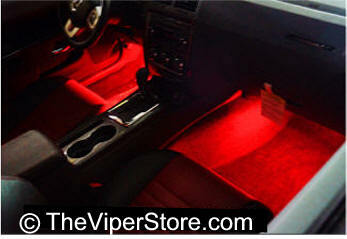 Then the infrared remote control requires no wires for you control multiply functions of your LEDs. 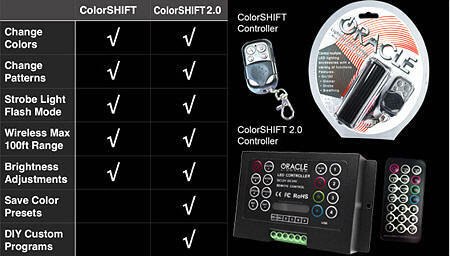 Our new ColorSHIFT 2.0 LED Controller has several advantages over the previous version. This new controller can be programmed by the operator for an almost endless number of colors and functions that the user can design and save on the units memory. Another major change to this new unit is that the box itself has a controller as well as a wireless infrared remote control. There is also a LED indicator on the unit that shows the operator what color the LEDs are set on at that time. Our new 2.0 controller also has twice the output and expandability as the previous version with 18A capacity which can power twice as many lights from this single box. 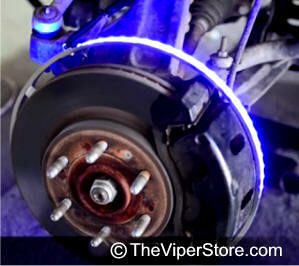 This 2.0 ColorSHIFT Halo Kit can produce any color including whites from 3000K-15000K with the push of a button. This allows the user to dial-in the exact color rings that they desire. Even if the color changing function is not appealing to the user, the ability to create the exact hue you are after is something that was not available until now. These 3-Chip 5050 SMD rings are BRIGHT, and for some they may be too bright, that is why (for the first time) the user has full control over the ring brightness. Customers have expressed their concern that the original remotes used the same RF frequency that is why we did away with RF altogether and now use an Infrared Wireless Controller System. 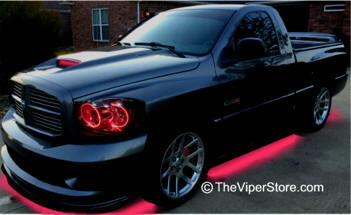 LED product such as our Flex Strips. For simple control over RGB flex strips. Includes inline switch and plug. Visible markings for the + and - 12V and LED sources. 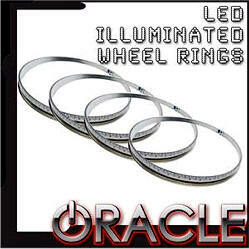 These "Tron" inspired wheel rings were under wraps while construction, fitment, and durability was highly scrutinized by the ORACLE Lighting R&D Team. Designed to fit around the brake rotors of your vehicle, the ring illuminates the barrel of the rim with High Grade LED Flex Strip. If you are looking for a "head turning" auto mod with just enough sophistication and flair, then these are perfect for you! 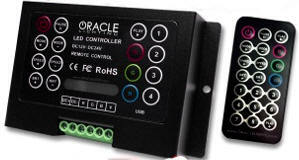 • Wheel Ring Diameter: 15.5"
1 x ORACLE LED Illuminated Rocker Switch. NOTE* Fits up to 13.5" Rotor- Rotors over 13.5" up to 15.0" are considered oversized and we have added the expanding adapter option to ensure proper fitment. NOTE* This item is built-to-order which means there is a processing time of up to 10 business days to have your item built assembled, and shipped. Hook them up directly to your cars electrical system or order our remote with battery pack included. 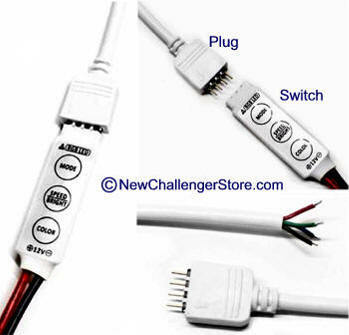 By using the remote you don't need to hook the wires into your cars electrical system. 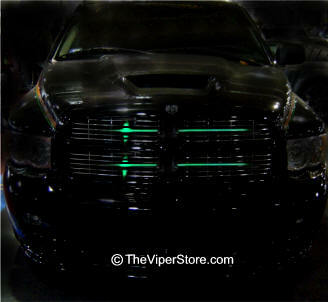 LED light bar scanners have a wide variety of functions. Comes with a wireless remote control where you can change the patterns at the touch of a button. Easy to install two wire connection. Choose between the 15" double bar or 22" long single bar scanner. LED model choose one color, ColorShift model changes colors with the Dynamic ColorShift includes a multiple colors and an upgrade remote with more options. 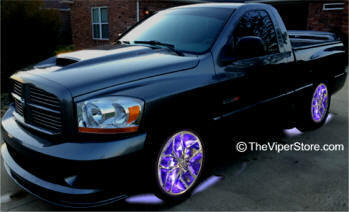 Available in White, Blue, Red, Green, and Amber or ColorShift multicolor. These LED lights can be used anywhere inside or outside. Just use your imagination! Remote control comes with the ColorShift selection. 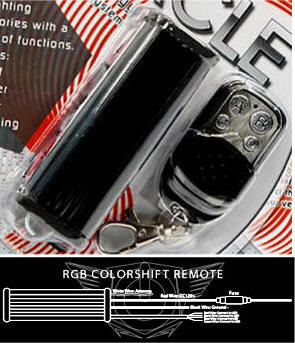 For single color option the remote is available to purchase if desired. 2 x 30" LED flexible strips and 2 x 48" LED flexible strips all with connector wires solder to one end. Choose one color or ColorShift which comes with a remote. 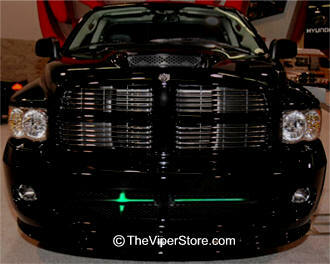 If you choose a single color this set is ready to wire directly you your car. 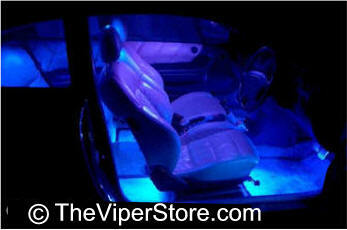 If you want to control these single color lights you will need to purchase the optional switch or remote control. You cut the strips at cut points to shorten if you wish. 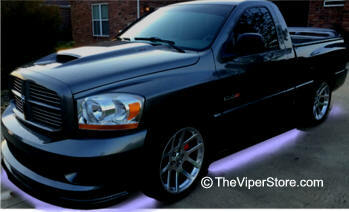 48" x Rear LED strip, 48" Front LED strip, 2 x 36" Side LED strips. Each one side connector wires soldered on to one end. You cut the strips at cut points to shorten if you wish. 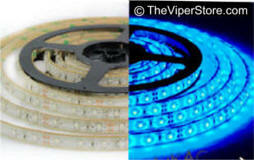 2 x 15" LED flexible strips. Choose one color or ColorShift. Each lighting strip comes with connector wires soldered on to one end.